The Borgias is the sordid saga of one of the most remarkable and legendary families in history. Set in 15th century Italy at the height of the Renaissance, The Borgias chronicles the corrupt rise of patriarch Rodrigo Borgia (Academy Award winner Jeremy Irons) to the papacy, where he proceeds to commit every sin in the book to amass and retain power, influence and enormous wealth for himself and his family. Don’t miss a minute of the lav.. The Borgias is the sordid saga of one of the most remarkable and legendary families in history. Set in 15th century Italy at the height of the Renaissance, The Borgias chronicles the corrupt rise of patriarch Rodrigo Borgia (Academy Award winner Jeremy Irons) to the papacy, where he proceeds to commit every sin in the book to amass and retain power, influence and enormous wealth for himself and his family. Don’t miss a minute of the la.. The Borgias return for more seduction, schemes, and outright villainy in all 10 riveting episodes from the second season. 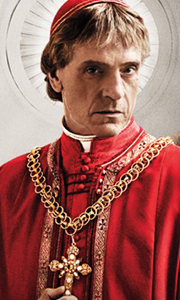 Academy Award winner Jeremy Irons is back as Rodrigo Borgia, the power-hungry patriarch of the Borgia clan, who has schemed his way to the top of Roman society as Pope Alexander VI. But with absolute power comes even more powerful enemies who will stop at nothing to see him toppled. While the Pope schemes to destroy ..
Jeremy Irons (Reversal of Fortune) leads a powerful cast to the spoils in his Golden Globe - nominated role as Rodrigo Borgia/Pope Alexander. Bribing his way into the most powerful cloak in 15th century Italy is just the beginning. As Pope, he wields the influence of the Church to seat kings and control global land, amassing unlimited riches. With enemies lurking in every corner, will their own greed, lust and wrath be the fall of their..
Academy Award winner Jeremy Irons returns as the savvy and scheming Pope Alexander in all ten episodes from the riveting third and final season of The Borgias. Beset by enemies at every turn, Alexander responds with an iron will to purge the Vatican of those disloyal to him. But as he struggles to establish the Papacy as a hereditary monarchy across the heart of Italy, his emboldened children have their own plans for seizing power: Cesa..